Create safe areas around airplanes using our fantastic Jettrac. 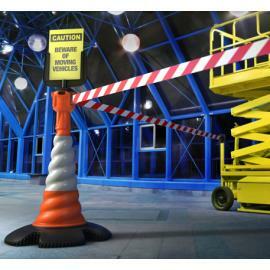 The solid construction secures it´s functionality even in the toughest environments. Used by some of the worlds leading airlines. Easy transportation due to high quality wheels and rollbar. Even available without belt, receiver only. Contact us for more information. For cordoning in crowded terminals we recommend our Classic series. 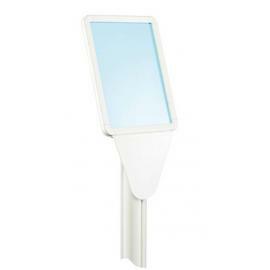 These can be fitted with sign holders (A3 or A4) and the retractable belt can be ordered with print. Most often used in areas with high demands on functionality and durability. Cordoning on fixed places is easy with our wall mounts. Whether it concerns a shorter belt at a check in, shop or toilet or at a extra long belt at a working area at the hangar, we have the product you need. 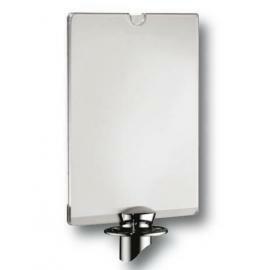 Discrete Sign Frame A3/A4 for our traditional stanchions Luxor and Style. Can I still attach a barrier rope after I have mounted the frame? 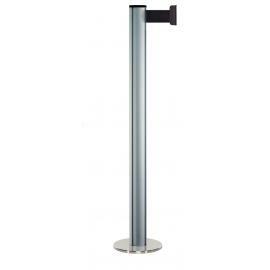 Sign frame in aluminium frame in sizes A3/A4 for our traditional stanchions Luxor och Style. 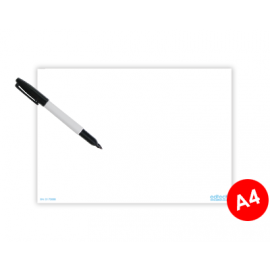 Both back and front include a transparant pmma sheet, so you can easily slide in your standard A4 paper from your printer. 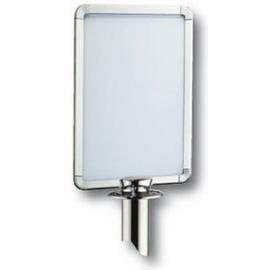 These high quality retractable barrier sign frames simply fit on the top of your barrier and are the perfect solution for que guidance and advertising. Each sign frame is not only stylish with elegant radius corners but these also act to eliminate sharp edges to ensure the safety of your customers. Frames are available in both portrait or landscape format and sizes of size A4 and A3. Feature twin clear acrylic panels designed to accept regular printed paper media and come in a choice of finishes to suit your checkout or entrance. This accessory includes an 8-way swivel feature for posts with 2.3 m belt lengths, or a fixed adapter for posts of 3.7M lengths. 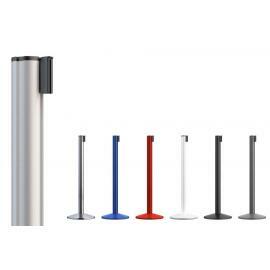 This is our most popular barrier for retailers and those in the leisure and entertainment sector, the elegant design and sleek finish of these retractable barriers are designed to compliment most colour schemes and interior layouts. Each post features 4 dovetail grooves that function as embedded receivers for retractable belts. Each posts come with a standard non-marking rubberized base to protect flooring. Beltrac Premium is our best-seller among the barriers we offer.Premium is mobile and can easily be connected to next barrier in different set-ups. The unique Beltrac connector makes it possible to attach up to 4 belts to the barrier. Beltrac Premium has a height of 1m and is made out of aluminum. 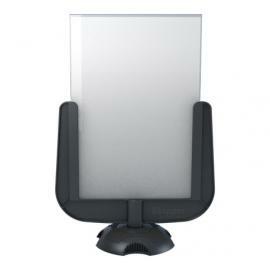 It stands on a ruberised base to avoid scratches on your floor. The retractable belt has a length of 2,3m. Every product is custom-made so you can decide the colour combination. Choose between 14 different belt colours and 6 different colours for the barrier. 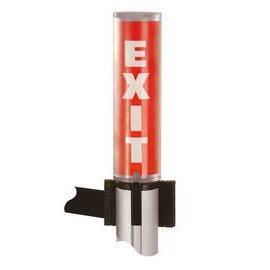 The retractable belt can easily be connected to the next barrier using the standard connector at the end of the belt. 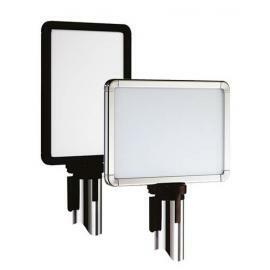 If you want to connect the connector to a wall or other flat surface you can use our wall receptacle which can be purchased here. 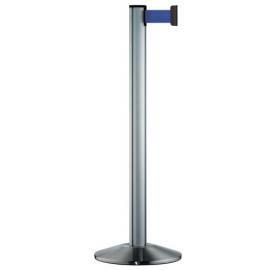 Beltrac Premium Permanent is a stanchion made of aluminum. The foot is attached with bolts that are attached directly to the floor. Choose from differnet designs and combine with a suitable cordoning belt. Or choose belt with your print of logo, color or text. We are happy to help!